What with work, our wedding, two weekends of family and friends visiting and planning our European house hunting trip I just haven’t had much time to get into the kitchen and do much baking. 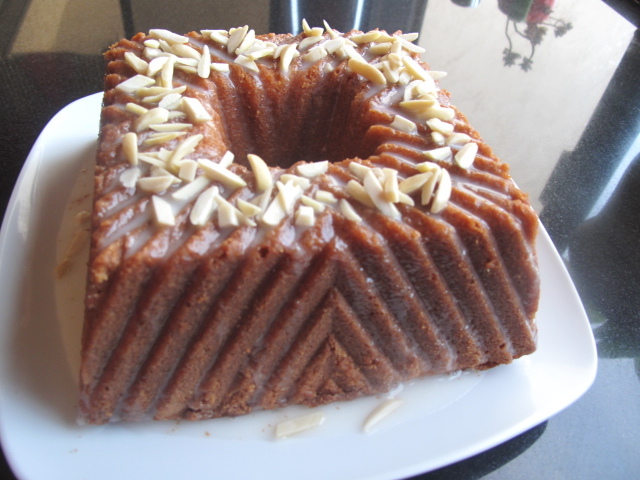 This weekend I did manage to find a few minutes to throw together this really easy bundt cake. I have to admit that I did the mis en place the night before and in the morning I just mixed it all together and got it in the oven in about 10 minutes. 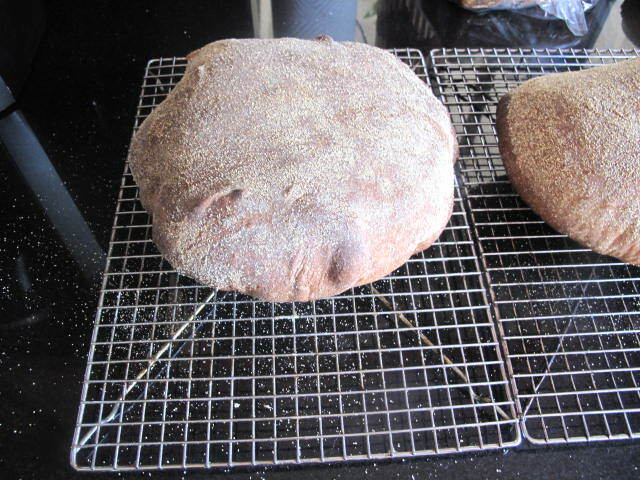 It has a very long slow bake so I was able to get the kitchen cleaned up and the ironing done before it came out of the oven so easy to plan chores around this one. I haven’t tasted it yet and probably won’t until tomorrow as I usually bring the weekend bakes to work but it certainly smells good and the whole house smells of vanilla and coconut and has my mouth watering and stomach grumbling so I may have to break down and have a slice a little later. 1. Make the cake: Preheat oven to 325F. 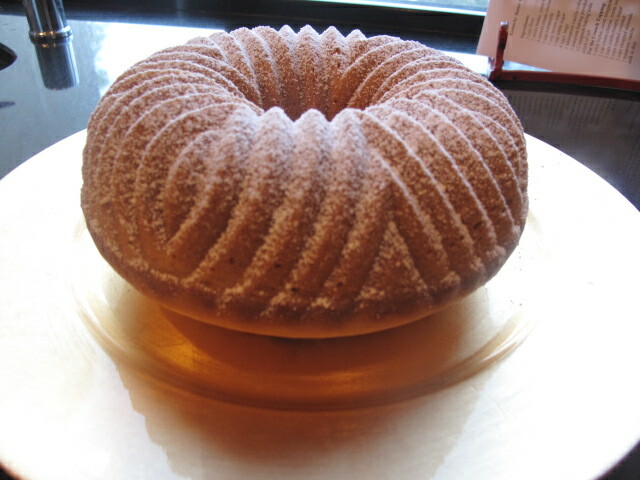 Butter a 12-cup Bundt or kugelhopf pan; dust with flour, tapping out excess. Place raisins and rum in a bowl, and let soak. 2. Whisk together flour, salt, and baking powder. 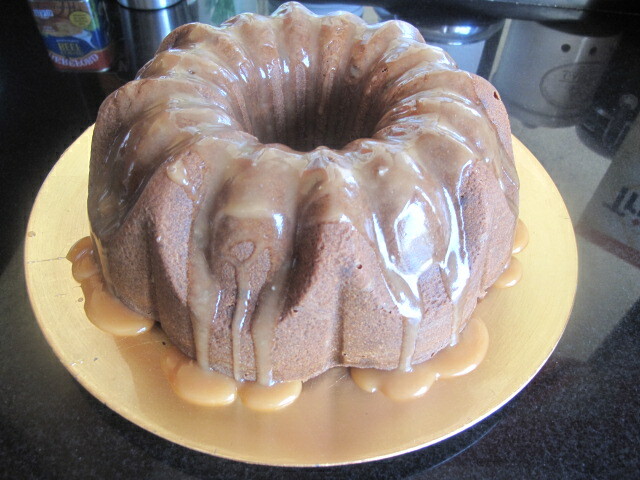 With an electric mixer on medium speed, beat butter and brown sugar until smooth, about 3 minutes. Add eggs, 1 at a time, beating well after each addition. Add vanilla. Reduce speed to low. 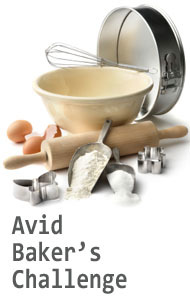 Add flour mixture in 3 batches; alternating with 2 batches of cream; beat until just combined. 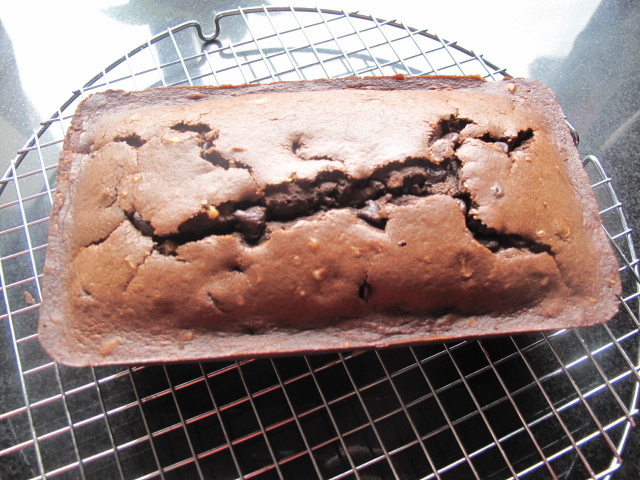 Mix in raisin mixture and coconut. 4. 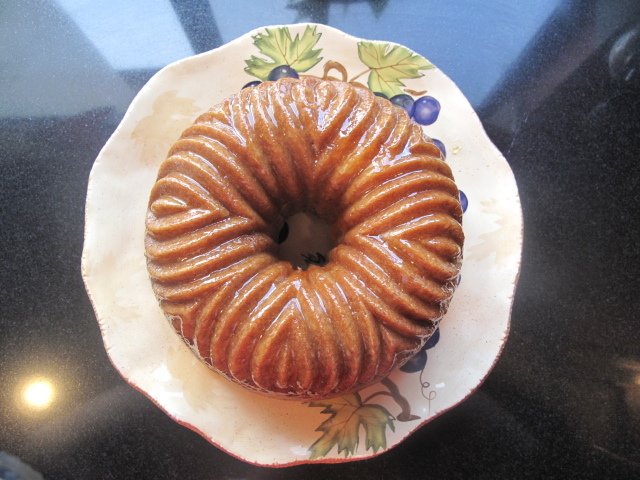 Make the glaze: Heat granulated sugar and the water in a small saucepan over medium-high heat, gently stirring, until sugar is dissolved and syrup is clear, cook, without stirring, until syrup comes to a boil, washing down sides of pan with a wet pastry brush to prevent crystals from forming. Let boil, gently swirling, until the mixture turns a medium amber. Remove from heat. Add rum and cream. Let cool, stirring until thickened. Drizzle over cake. Peaches are my favorite fruit and I am always looking for new ways and new recipes to use them in. 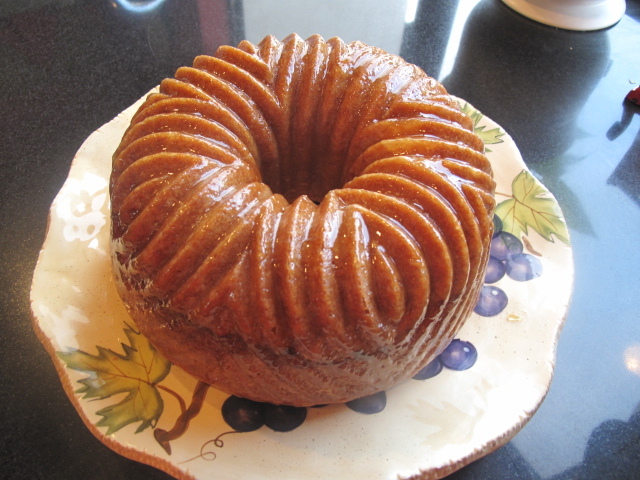 I was excited to find this easy bundt cake recipe that used fresh or frozen peaches. 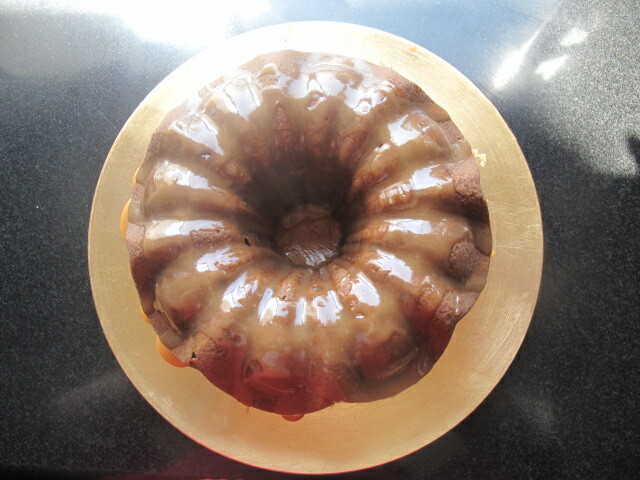 I had high hopes for this cake and loved the fact that it was so simple to toss together as lately I often seem to be short on time to get into the kitchen and indulge in some time-consuming baking. 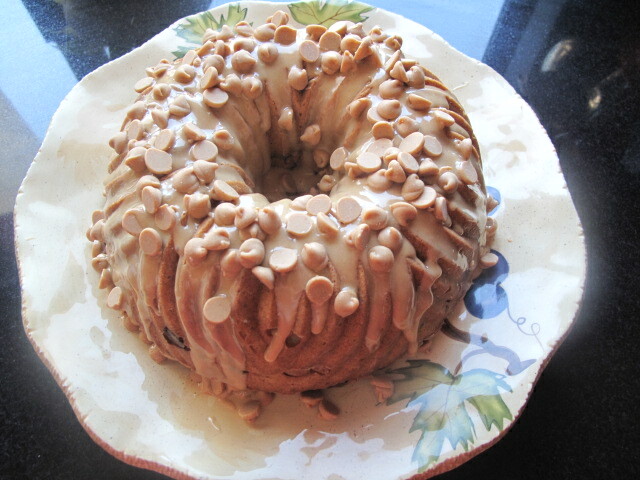 I still like to have baked goods on hand to snack on or share with friends and family. This one seemed to fit the bill. I have to admit that while the cake is incredibly moist I found it to be a bit bland. It really didn’t seem to have much flavor at all and even the peaches seemed to fade into the background. Needless to say I was a bit disappointed. With that being said I took the cake to work and everyone raved about it. I think every single person who had a piece stopped me to say how good it was and several asked me for the recipe so I am going to have to call it a huge success and scratch my head over why I thought it was so bland. Preheat oven to 350’F. 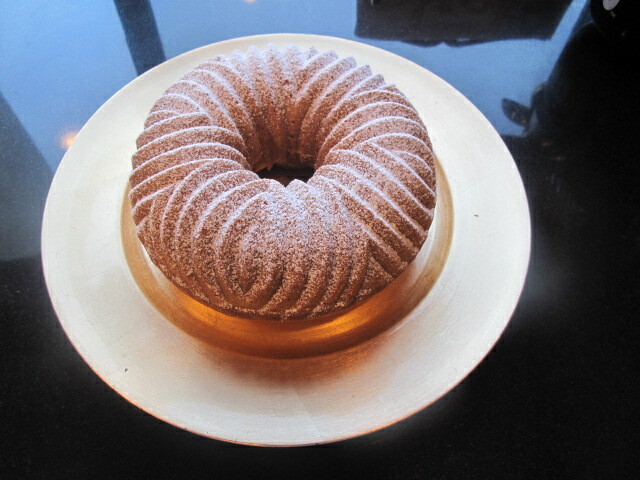 Butter a 14-cup Bundt pan; dust with flour, tapping out excess. In a medium bowl, whisk together 3 cups flour, the baking soda, and salt. In another bowl, toss peaches with remaining 2 tablespoons flour to coat. 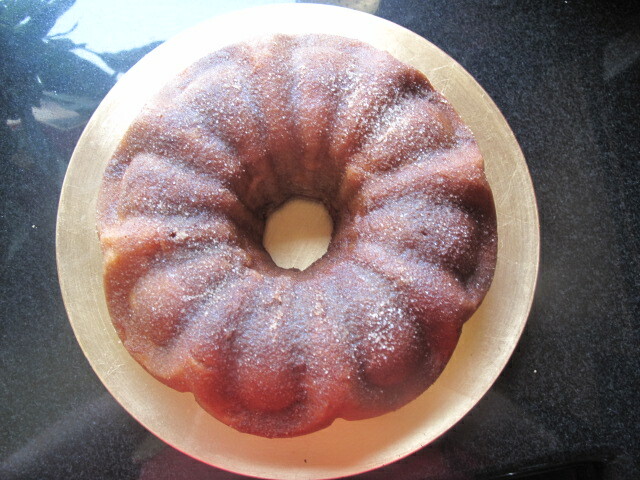 With an electric mixer on medium-high speed, beat 1 cup butter and 2 cups sugar until pale and fluffy, 3 to 5 minutes. Add eggs, 1 at a time, beating well after each addition. Reduce speed to low; add flour mixture in 2 additions, alternating with sour cream and beginning and ending with the flour; beat until combined. Fold in peaches and vanilla. Transfer batter to prepared pan; tap pan firmly on counter several times. 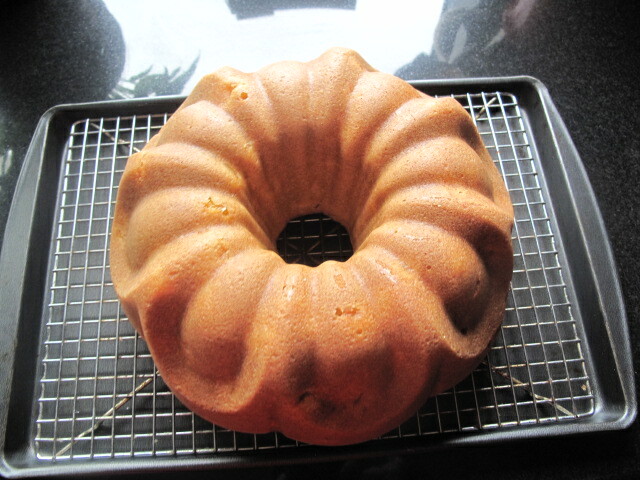 Bake until a cake tester comes out clean, about 60 minutes. Transfer pan to a wire rack set over a rimmed baking sheet to cool 15 minutes. Being from an Italian family and growing up in Youngstown, Ohio where there was a large Italian population it is inevitable that Spumoni was bound to turn up here sooner or later. As a child I loved spumoni ice cream and it was readily available in Youngstown both in restaurants and in the grocery store. When I moved to California it was almost as if the stuff ceased to exist. For the first 20 years that I lived here I never saw it either in the grocery stores or in Italian restaurants. I understood this in the fancy trendy restaurants but I would have thought it would have been a staple in the mom and pop places that I frequented in my lean military years out here. Nothing. 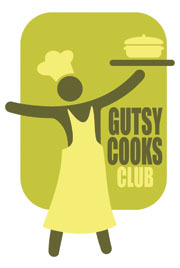 When I moved to San Diego and got into the foodie scene, most people I talked with had never even heard of it. When we sold our suburban home and moved into town I was floored to discover that the little Italian restaurant just around the corner had spumoni on their menu and it was like childhood all over again. I order it every time we go to that restaurant. In the last year or so I have been surprised to occasionally find it in the grocery store and of course a gallon of it always comes home with me when I find it. This cake was a delightful surprise to find and I of course had to try it. 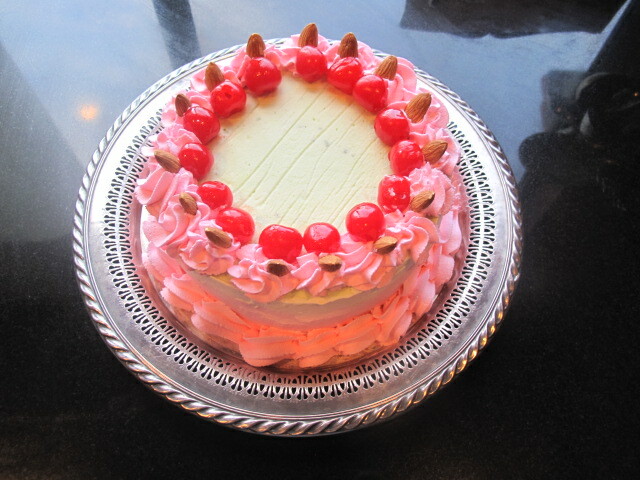 It really isn’t a cake but two frozen mousses (a cherry and almond layer and a pistachio layer) covered in sweetened whipped cream. It does surprising taste like supmoni ice cream and the only thing I would change is that I would add almonds to the almond layer along with the almond extract. 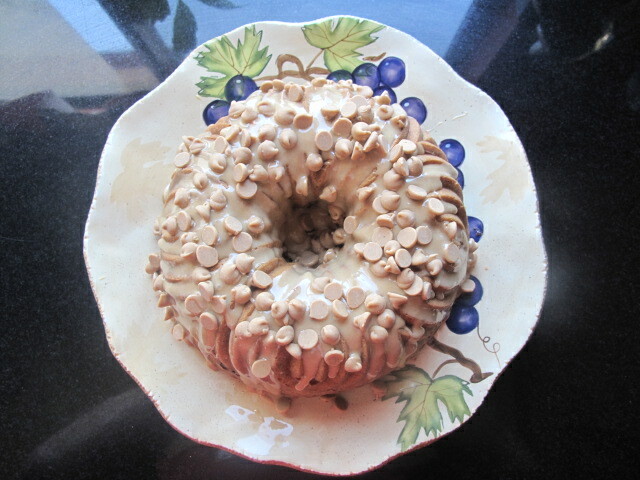 For now I just sprinkle some silvered almonds on each serving. Place the 2 tbsp. cherry juice in a medium saucepan and sprinkle gelatin over water. Let stand for 1 minute. Whisk in egg yolks and sugar; mix well. Stir in milk. Cook over medium heat, whisking constantly. Cook until thickened considerably 7-10 minutes. When done, it should be thick enough to coat the back of a spoon. Stir in chopped white chocolate and blend with a whisk until chocolate has melted and has an even color. Let cool. Whip cream until stiff peaks form. Gently fold whipped cream into the cooled cherry mixture until well blended. Pour into a prepared spring-form pan and level the top with a rubber spatula. Pick up and drop the pan once or twice to settle any gaps that may have been created when the mixture was poured. Place in freezer and freeze until firm. Wash and dry your saucepan, bowl, spatula, whisk and beaters for the next layer. Whip heavy cream until soft peaks form, and then gradually add the sugar. Add in the vanilla and beat until stiff peaks form. Frost the upper half of the mousse cake white whipped cream; avoid frosting the top – we want the pretty green color of the pistachio mousse to show. 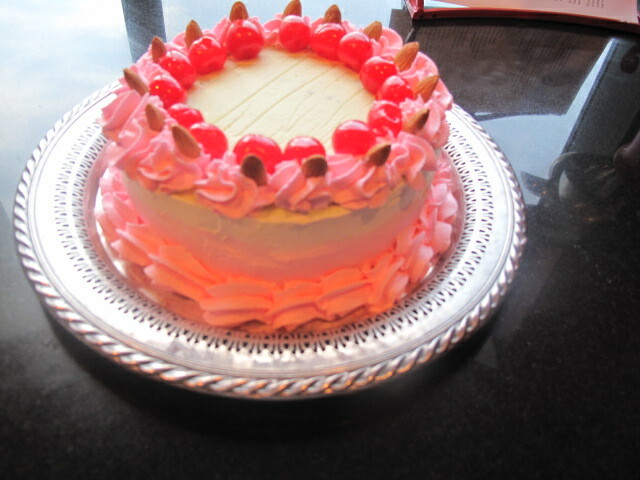 Tint the remaining whipped cream pink and frost the lower portion with the pink whipped cream. 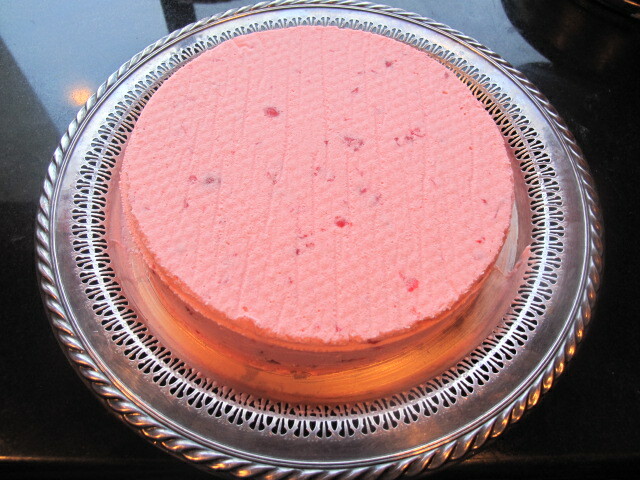 Use one large spatula to smooth the two colors together on the sides of the cake. Transfer remaining pink whipped cream to a piping bag fitted with a large star tip. Pipe 12 pink whipped cream florets on the top outer edge of the cake. 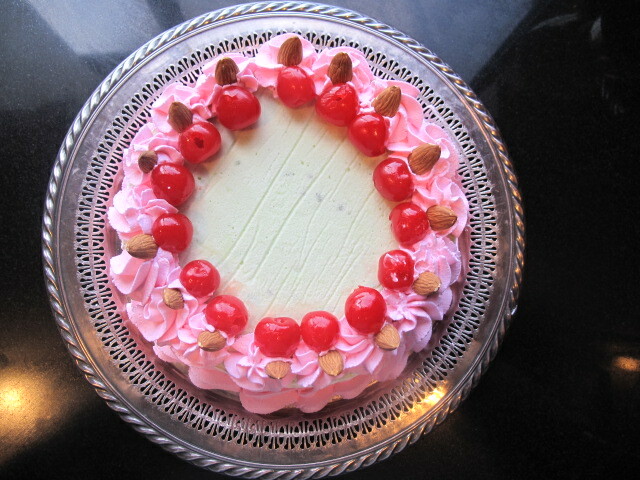 Place a cherry in the center of each floret. Store cake in the freezer. Slice into pieces while still partially frozen. Serve frozen or let slices come to room temperature. Between social obligations and being away in Michigan visiting my best friend Jill it has been several weeks since I have been able to bake. 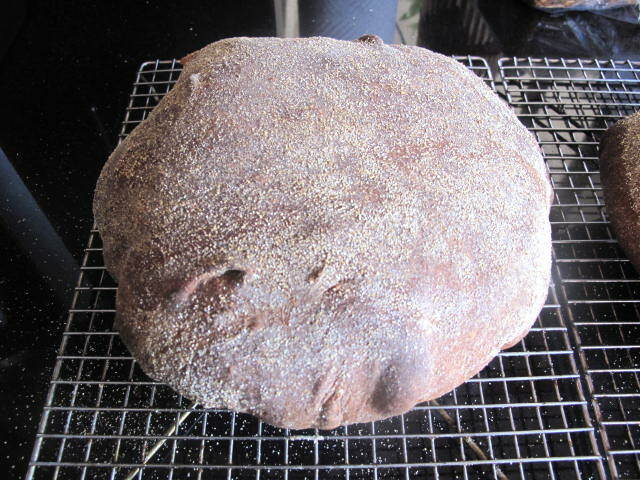 This was a rather busy weekend as well so I wanted something quick and easy to ease back into baking. 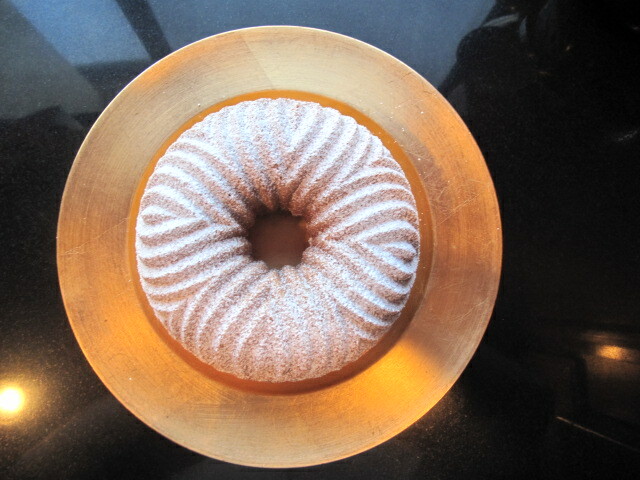 This easy bundt cake was just the ticket. It only has a few ingredients and goes together in about 10 minutes, mostly by hand so not alot of clean up either. 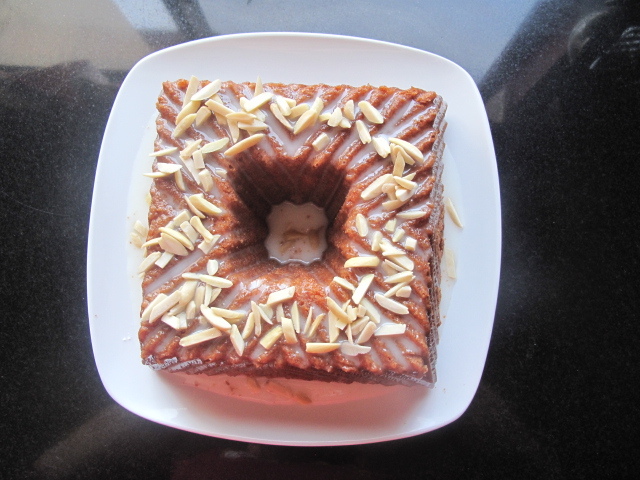 It is a rather small cake but packs a nice lemony punch and is just the thing for early morning or late evening snacking. 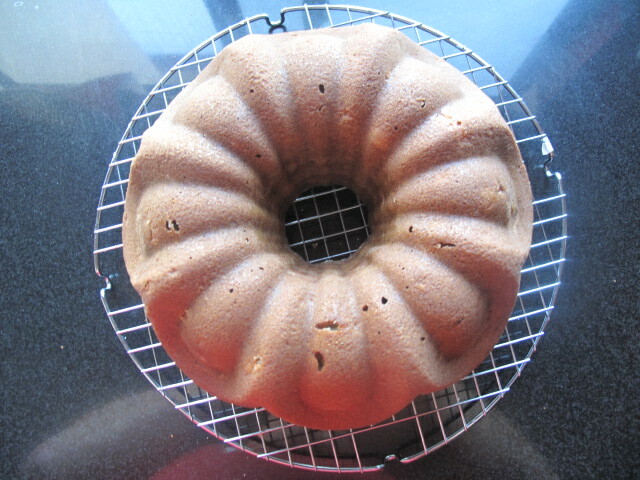 Lightly grease and flour an 9 1/2 inch bundt cake pan. Melt butter and let cool completely. Grate the zest of one lemon. In a large bowl beat on medium speed eggs and sugar until light and fluffy. In a medium bowl whisk together flour, baking powder and salt, then alternating with the cream gently fold into egg mixture with a spatula, keep folding until mixture is combined, gently fold in lemon peel, vanilla and melted butter. Pour into prepared pan and bake for approximately 40-45 minutes. 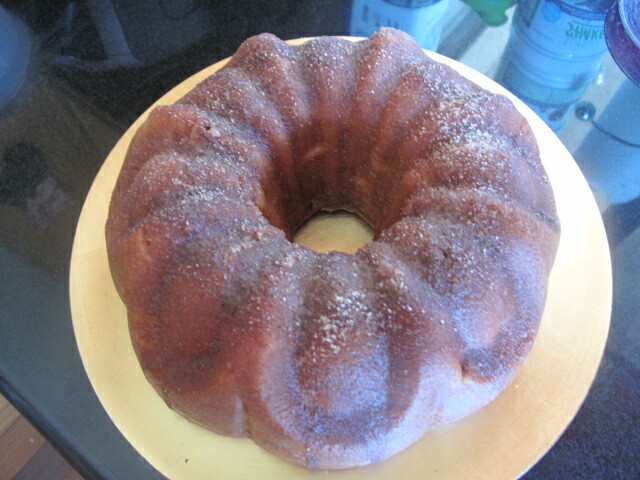 Let cool, then dust with confectioners sugar. 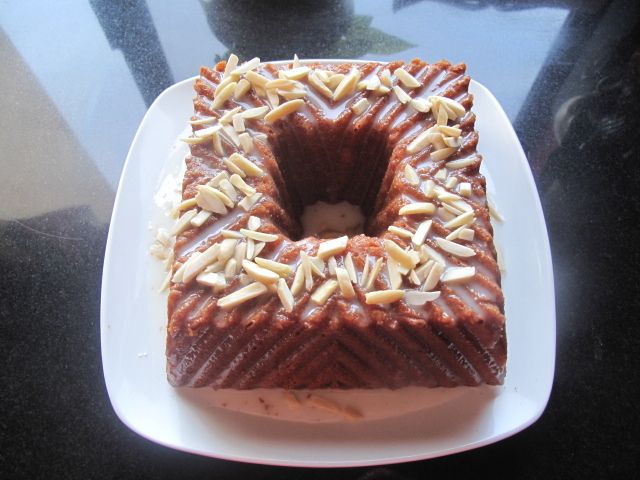 I came across this cake on yet another of my Google searches for new bundt cake recipes. I love apple cakes and this one has that cream cheese type cheesecake filling in the center and lots of tart Granny Smith apples chopped up in the cinnamon-nutmeg spiced batter so I figured it was worth at least one try. 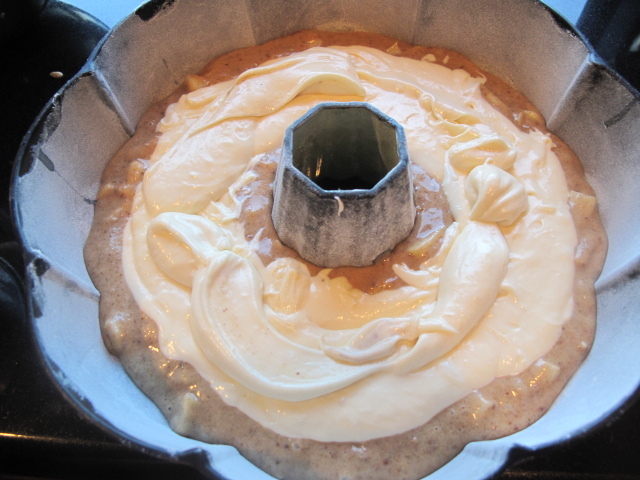 Spoon about 1/2 to 2/3 of the cake batter into the prepared 12-cup bundt pan. Top evenly with the cream cheese filling, leaving a 1-inch border around the edge of the pan (I found this tricky, just do the best you can). 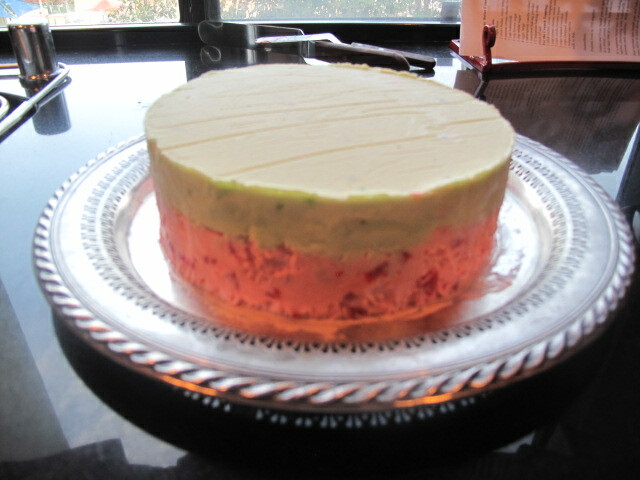 Use a thin paring knife to swirl the cream cheese filling with the cake batter just a few times – less is more. Top the filling with the remaining cake batter. 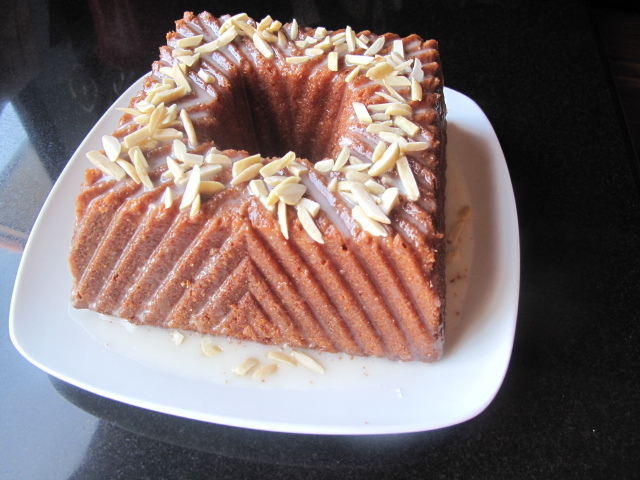 Bake for 60-75 minutes, or until a thin knife inserted in the center of the cake comes out clean. Transfer the pan to a wire rack and cool for 15 minutes, then invert the cake onto the rack and allow to cool completely (at least 2 hours). To make the frosting: Combine the brown sugar, butter and milk in a 2-qt saucepan. Set over medium heat, and bring to a boil, whisking almost constantly. Boil for 1 minute, whisking constantly. Remove the pan from the heat and stir in the vanilla. 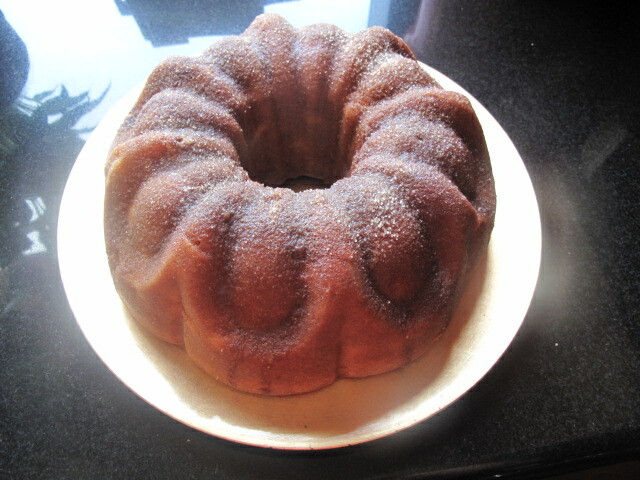 Whisk in the confectioners’ sugar, a little at a time, until it is completely incorporated and the frosting is smooth. Gently stir the frosting until it starts to thicken, then pour it over the cooled cake. 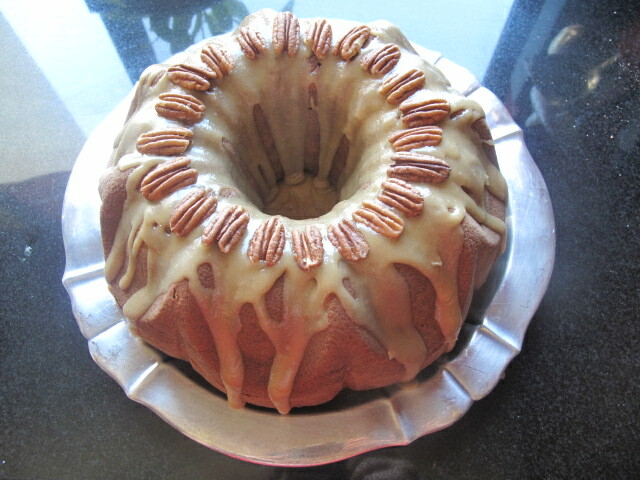 (The frosting will set up quickly, so don’t make it in advance – wait until the cake has cooled completely.) 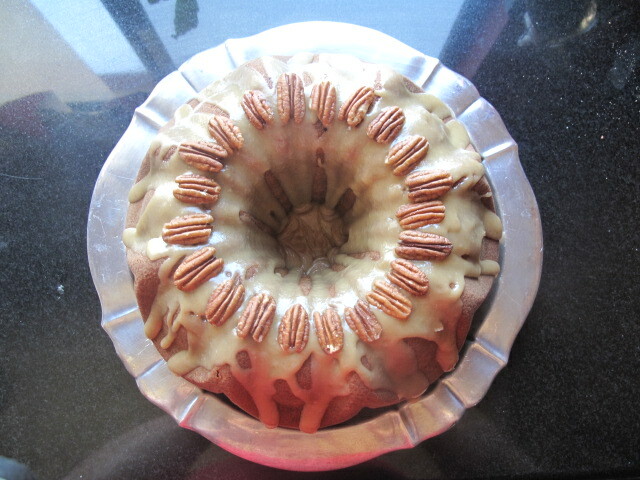 Garnish with extra pecans, if desired. 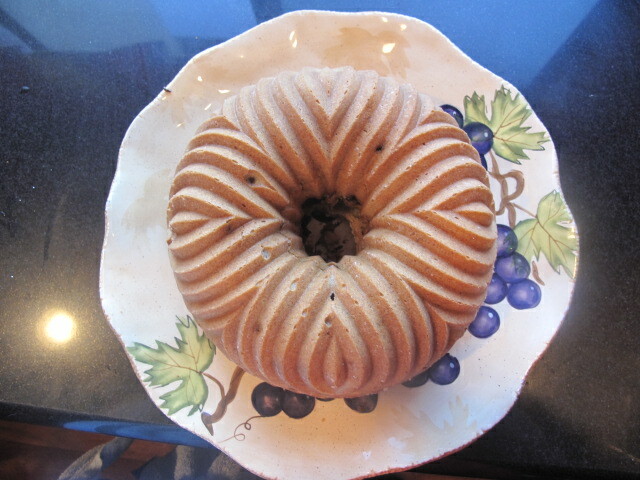 Now that my friend Jill has me totally hooked on bundt cakes it seems as though I am constantly on the lookout for new bundt cake recipes. 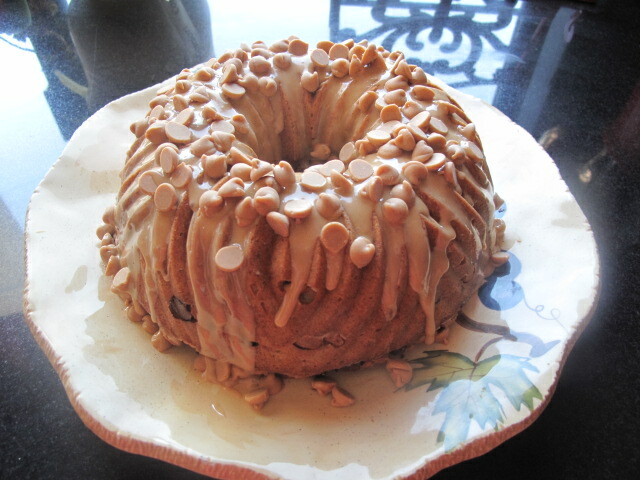 A recent search on the internet turned up this peanut butter and banana cake. I am crazy about banana cake and peanut butter and banana sandwiches were a childhood favorite (actually, they still are a favorite) so I knew I had to try this. The recipe calls for peanut butter filled DelightFulls which are chocolate morsels filled with peanut butter. They are made by Nestle Toll House and actually come in about 6 flavors of filling. I went to about 5 different stores and couldn’t find them in any flavor so I decided to just use regular semi-sweet morsels and peanut butter morsels and just use half the amount called for of each. I think it worked out fine. I imagine you could used mini Reeses peanut butter cups and chop them up and get the same flavor. It all seems good to me. 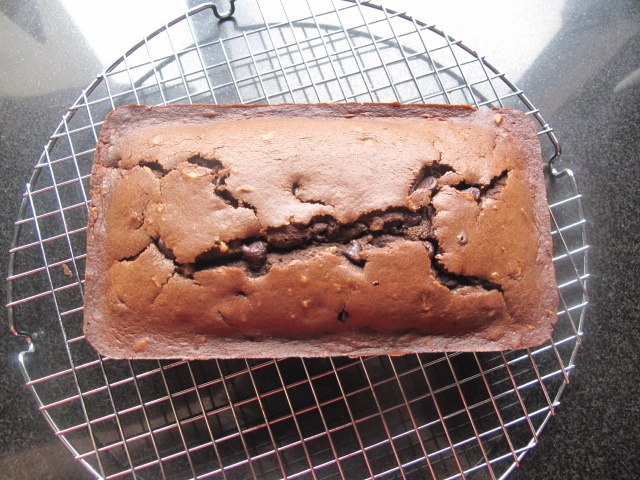 It is an easy cake to put together and has a nice rich banana flavor which is nicely set off by the chocolate and peanut butter chips. In all honesty I think I would like it just as well as plain banana cake. See what you think. Take ½ cup of the DelightFulls™ from the bag and chop into halfs and ¼ pieces. Set aside. In a small bowl, toss together the remaining DelightFulls™ and 1 tablespoon flour to coat the morsels. Set aside. Preheat oven to 350°. 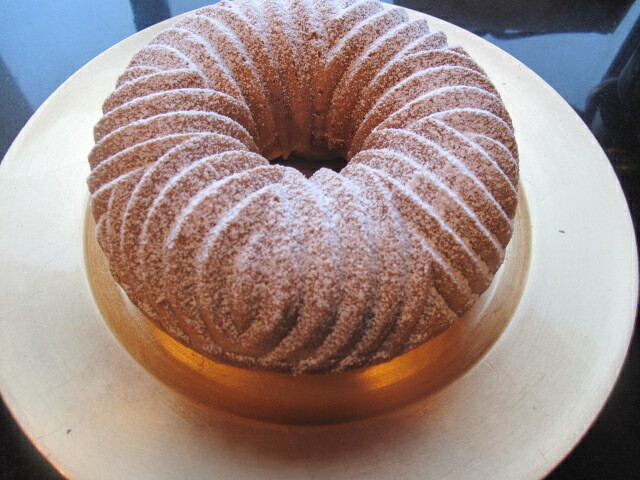 Spray a small bundt pan with non-stick baking spray. Set aside. 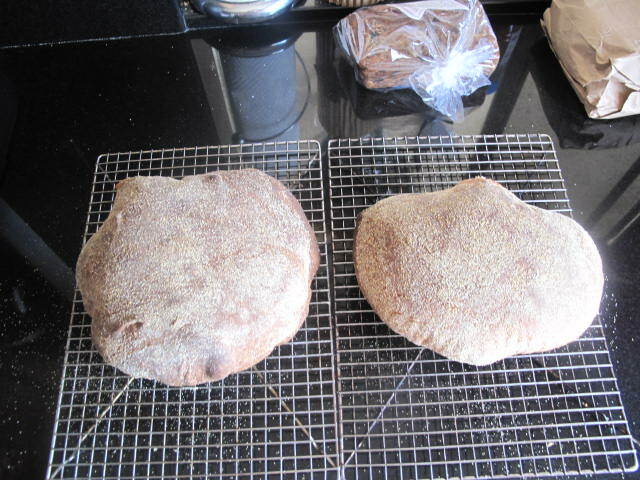 In a small mixing bowl, whisk together the flour, baking powder and salt for 30 seconds to distribute the leavening. In the bowl of a food processor, puree the bananas until smooth. Add the oil and then the eggs, one at a time, mixing until combined. Add the vanilla. In the bowl of a stand mixer fitted with the paddle attachment, cream together the sugar and butter until light and fluffy. Scrape down the bottom and sides of the bowl and mix again for 30 seconds. 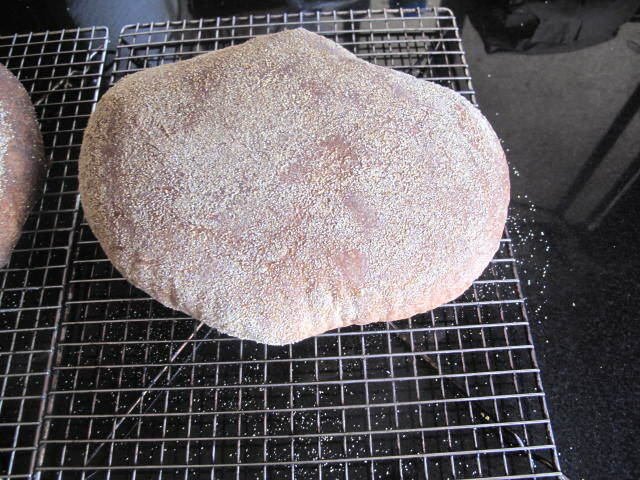 Add the flour, all at once, and mix on low until just combined and smooth. 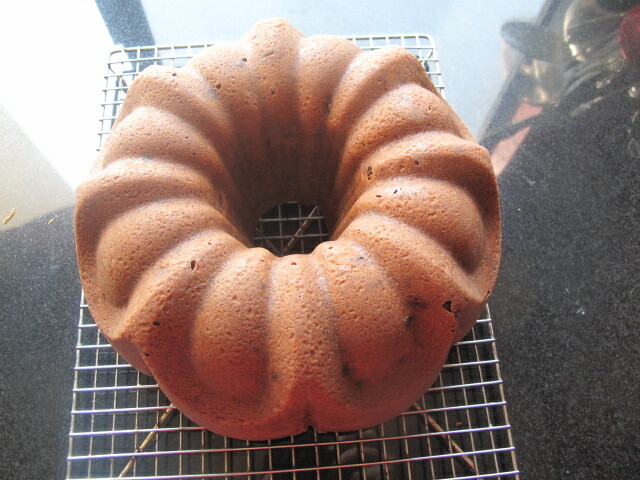 Pour 1/3 of the batter into the prepared bundt pan. Sprinkle ½ of the flour coated morsels over the batter. Pour 1/3 of the batter over the morsels and sprinkle with the remaining flour-coated morsels and top with the remaining batter. Bake for 1 hour to 1 hour and 15 minutes or until the cake springs back when gently poked and a wooden skewer comes out clean. Turn the warm cake out onto a serving platter. Allow to cool completely. In a small bowl, stir together the confectioner’s sugar, peanut butter, milk, vanilla and salt until smooth. Spoon over the cooled cake and sprinkle with the reserved, chopped DelightFulls™. Well, it has finally happened. I have abandoned my long time hatred of specialty pans and fallen under the spell of my dearest friend Jill, the Queen of Bundt Cakes and avid collector of bundt pans. 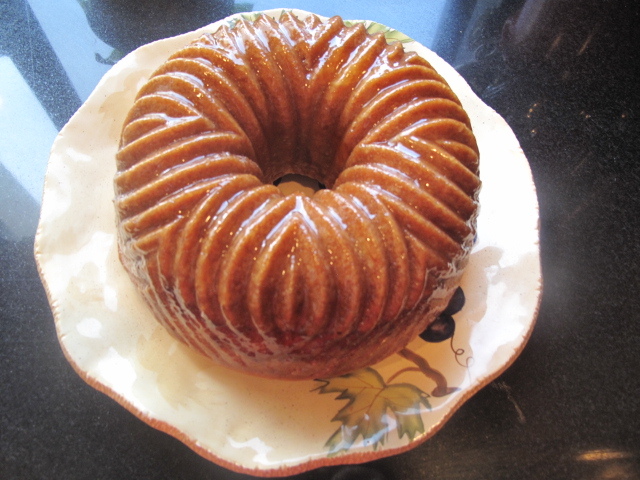 While I have been making my share of bundt cakes lately and really enjoying them, I have steadfastly stuck to my rule of not buying specialty pans. 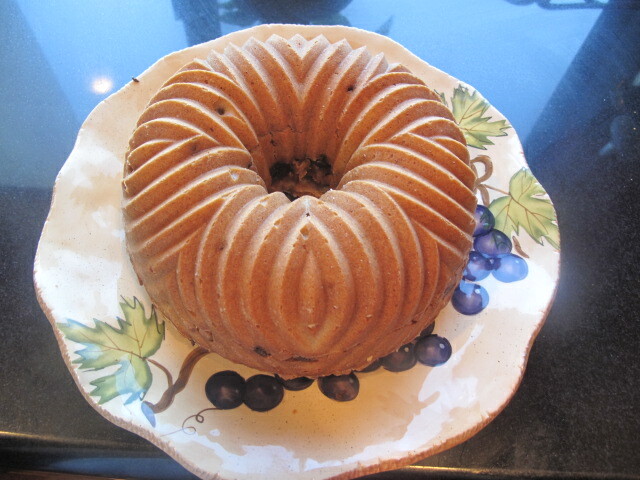 I have used only my old fashioned original bundt pan and my favorite Heritage bundt pan. Last weekend while rummaging through the used book stores I came across a small book called Bundt Cake Bliss by Susanna Short. I flipped through it, saw that it had a nice selection of cakes which could be easily made with common ingredients that I always have on hand. The book was only a few dollars so I tossed it on my pile and brought it home. Once I had a chance to really look through it and compile a list of the recipes I wanted to try I started thinking about Jills pantry cupboard and all her bundt pans neatly lined up and I started envying her for her collection. Then it dawned on me that I had a couple of Amazon gift cards in my drawer and off I went to check out which pans I could get for my gift cards. 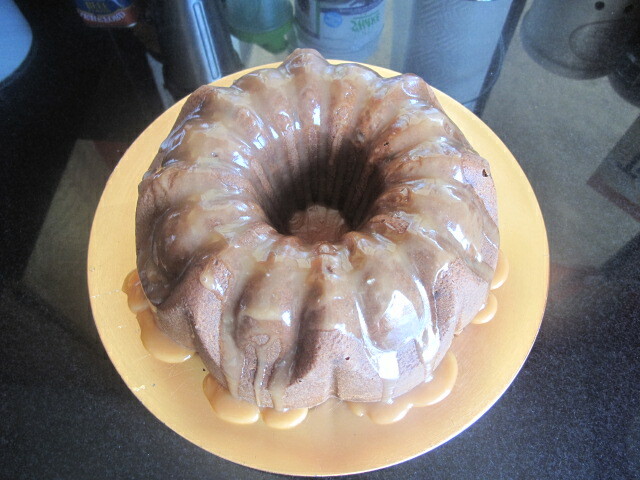 I decided on the Bundt Sqaured pan and the Bavaria pan. I used the Bavaria pan here and I am very pleased with the results. 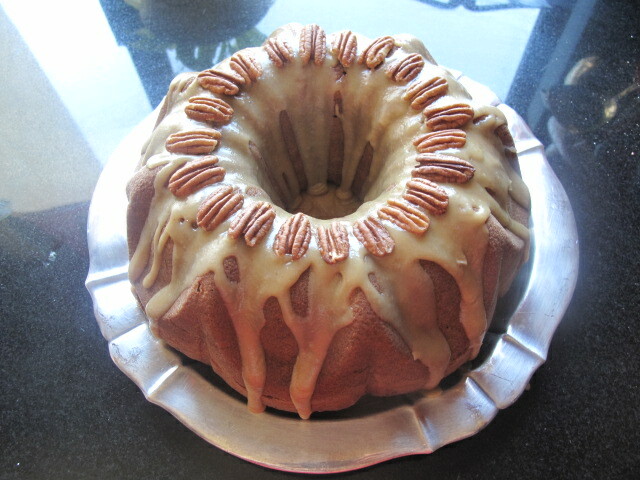 This was a very easy cake to put together and as I have often said, pound cake is my favorite. 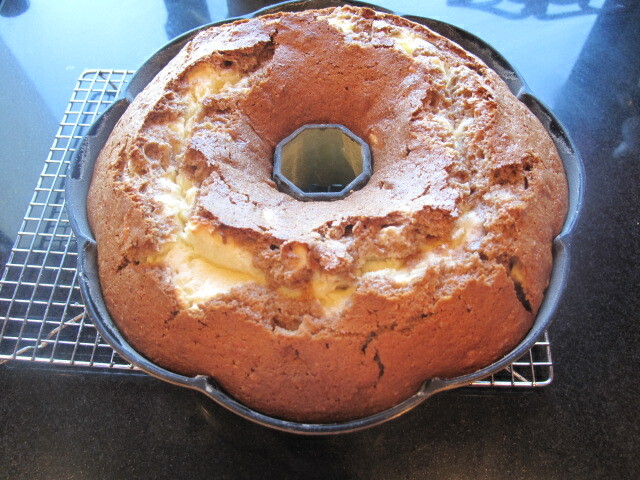 This one has the usual pound cake texture with the added benefit of a ribbon of apricot preserves in the center. I am sure you could easily substitute whatever flavor you wanted. Just leave out the almond extract or change that to go with whatever flavor of preserves you want. Have fun. Combine dry ingredients and set aside. Beat the butter for several seconds in a large mixing bowl. Add the sugar and beat until smooth. Add the eggs and almond extract and beat for 2 to 3 minutes or until light and fluffy. 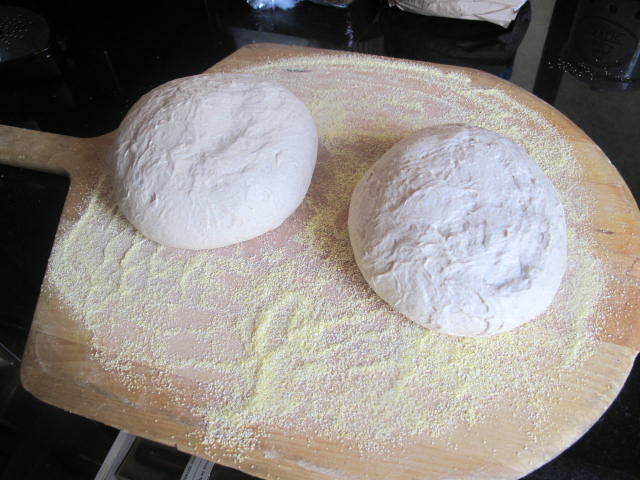 Add the flour mixture and beat until smooth. Add the sour cream and mix well. In a small bowl, whip 1/2 cup of the apricot preserves until light and the larger pieces of apricot have been broken into smaller bits. Pour half of the batter into the prepared pan. Spoon the preserves into the center taking care that the preserves don’t touch the sides of the pan. Spoon the remaining batter on top, being sure to completely envelope the preserves. Bake for 50 minutes or until a toothpick comes out of the cake clean. Let it cool in the pan for 10 minutes, and then turn onto a serving plate. To prepare the glaze, combine in a small saucepan the remaining 1/2 cup of apricot preserves, the lemon juice, and water. Bring to a boil and beat until combined and the larger apricot pieces of have broken into smaller bits. The glaze should be slightly thickened, but thin enough to pour. If it is too thick, add more water. If it is too thin, cook longer. Spoon or brush the glaze over the hot cake, taking care to cover it thoroughly. I hate beer, but I do like a stout and especially Guinness. Have never been able to figure out why I like it and hate the taste of beer so intently but that’s the way it is. 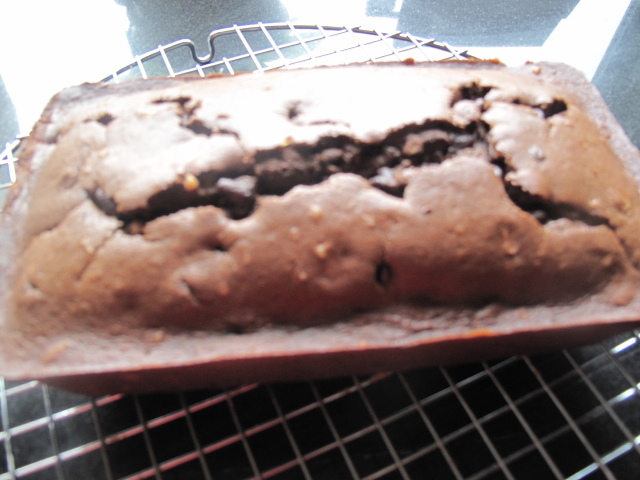 I especially like cooking and baking with Guinness and whenever I find a new recipe using it I always give it a try. I made this for St. Patricks day for our HOA party and it was well received. I didn’t get a chance to taste it that and I had a few bottles of Guinness left so I decided to make it again. If you’d like the frosting to be thinner, add a small splash of baileys until desired consistency is reached. If you’d like the frosting to be thicker, add I tbsp powdered sugar at a time until frosting is thick enough. 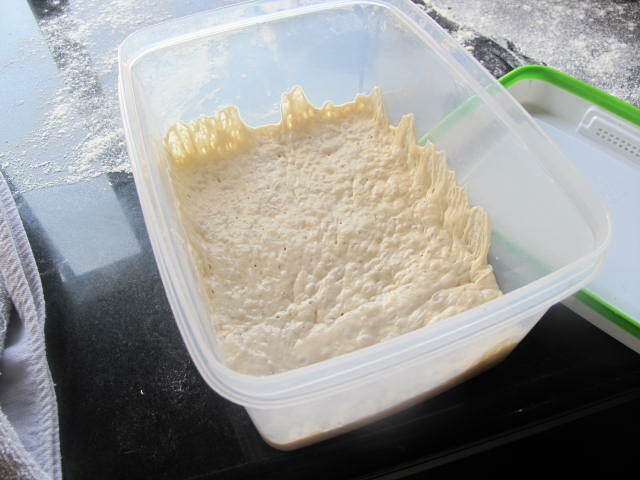 Bread can be stored in a sealed container and kept on the counter for up to S days.